Happy 2019! Looks like winter has arrived! Last weeks' polar vortex was a hoot, but at least we get to enjoy some extra walk time in the nice weather this week. We've been getting a lot of questions about whether pups need coats/protection etc. in winter weather conditions, so we hope you all find this newsletter helpful. It really all depends on your individual dog and humidity/windchill while outside. One of the best weather apps we've found (and I have 4 on my phone!!) is Dark Sky, giving an hourly overlook so you'll always be prepared. 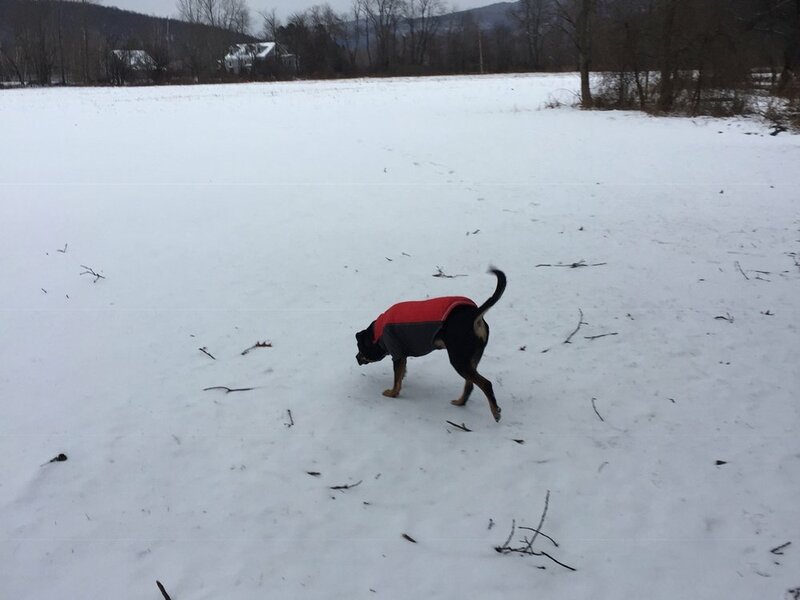 As a general rule, most dogs who are single coat breeds-bully breeds, greyhounds, dachshunds, some terriers, etc will need a coat at about 40 degrees and below. Very small dogs and thin dogs will also need protection. Double coated and other breeds are usually fine without coats for weather conditions at or near freezing (32F). Anything below or adding precipitation may require a coat. Additionally, dogs-like us, need to acclimatize gradually to the colder weather. So then, what kind of coat should you purchase? Enter any local pet shop or online retailer, and you'll find a myriad of options, ranging from hoodies, knitwear, fur rimmed, and the ever popular Canada "Pooch." Generally speaking, any coat that is relatively snug fitting and covers vital organs (stomach/chest) is the best bet. After years of trial and error, we've decided on a few favorites: the Ruffwear Powder Hound (seen in above photo) and Voyagers K9 Apparel. These coats are well made and will last years. Another great option is "horse blanket" style coats, which are often snug fitting and waterproof. These are available online from retailers such as Dover Saddlery and Stateline Tack. Knit wear and faux fur trim/hoods look cute, but aren't as practical. Knitwear isn't waterproof and often a dogs' claws, paws and foliage snag these coats. Protecting your pup's paws is an often overlooked step. Whenever the streets are salted, it's crucial to either wipe down paws after walks, or use paw balm or booties prior to walking. Shown in the photos are Earthbath paw/grooming wipes ($$$), or you can try unscented baby wipes, which work just as well. Target now carries pet wipes at a reasonable cost. You can also use a small dish of warm water or an old towel to wipe the grit and salt from your dog's paw pad area and belly after walks. Just be mindful of any other pets in the household who may drink out of dirty water containers! Balm or wax can also be applied with your fingers-a small amount is rubbed onto each paw pad just before the walk. Pawz and Musher's are two popular and accessible brands. If you'd rather skip these steps, there is also the option of using booties (everyone's favorite)!! However, there is a learning curve to using these, and not every pup adapts to wearing them. Be sure nails, including dew claws are trimmed short, otherwise the boots will fit improperly. If introducing for the first time, pair with some tasty treats, and just place one boot on at a time, allowing your dog to walk around inside wearing them. PawZ rubber balloon type booties are our favorite-they are durable, reusable, and won't cost a fortune to replace like some of the thicker fabric boots. 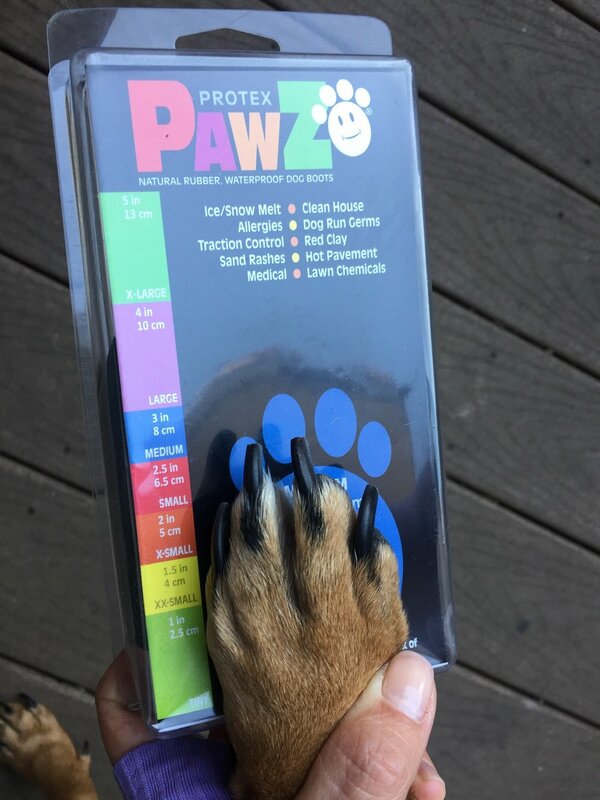 Measure your pup's paw circumference (including nails) to the image on the back of the box, or ask us if you're unsure! They come in many sizes and colors. We will be closed on Monday, February 18th for President's Day! If you anticipate needing a walk, please reach out and we will do our best to accommodate. Any walks will be billed at weekend/holiday rate.